a shine machine: cute idea! Ok so I don't know about you but I seriously love looking a home inspiration photos. I search Flickr almost daily looking at cute home tours and such. I was thinking it would be really cool to do a little home tour of all of our homes together!!! What do you think?? Would you be in? 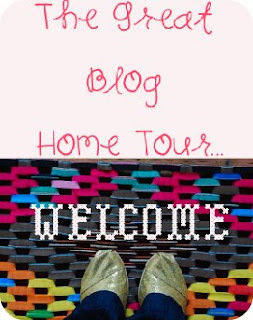 It would be like a blog tour of a home tour. You can link your blog in the comments section of the featured room post so that we can all check it out. Just make sure to link my blog on your posts!! I'll go ahead and post the schedule now because if you are like me, some cleaning needs to be done before we take these pictures :) lol! Now, I know that all of us don't have all of those rooms in our home. For example, I do not have a spare bedroom and I don't have a child's bedroom either. In this situation, I think it would be cool to substitute in something else, for example a favorite corner, an entry way, etc. 4. A great way to share and gather new home inspiration!! Are you in?? If so, leave me a comment on this post!!! yes, yes, yes!! I love this. Lots of cleaning to do!!! now i REALLLLLY heave to clean! oh! yes! me me me! i wanna play! we wont be all moved in till september! but i cant wait to see everyones! man I want to do this, but I am on vacation for another week and wont be home to take pictures :( but im excited to see everyone's! Sounds like fun! I will have to do some major house cleaning though! Looking for decorating ideas on Flickr is one of my favorite past times. Love it!! Fantastic idea Janel!! I am in! I don't know yet whether I'll manage to join because of the cleaning part ;) but I will really follow your blogs. Yes yes I'm up for it!!! Oooh, I love this idea! I'm in! me too! me too! Just discovered your blog through Miss Indie! What luck to find it on the day the tour starts! Oh! Oh! Oh! I am in, such fun! I will get started on this tonight when I get home from work. Fun! I can't wait to see everyone's houses though! i want to participate so ill just catch up tomorow!